Mathias Joseph Alten born in Gusenburg, Rhine Province, Germany to Michael and Maria Kyllburg Alten. Alten’s family moves to Marpingen, Germany. Young Mathias remains in the village until 1884. From an early age Mathias earns extra money by drawing and painting portraits. Lacking access to artist’s supplies, he improvises using such materials as miller’s chalk and laundry bluing. Alten is apprenticed as a painter and paperhanger in the town of Saint (Sankt or Skt in German) Wendel, Germany. 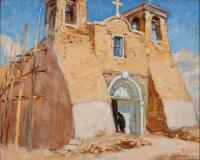 He also paints religious subjects in Roman Catholic churches and secular subjects for theatres. He becomes a certified apprentice under the tutelage of Joseph Klein. Alten arrives in the United States with his parents, brother John, and sister Katherine. The family moves to Michigan, settling with fellow German immigrants on the west side of Grand Rapids. Alten finds work as a decorator in local furniture factories. While employed by Charles C. Nooneman, Alten creates decorations for the Rathskeller, a German brew house at 90 Canal Street in Grand Rapids. During this same period, Alten begins taking art lessons at Edwin A. Turner’s studio. Mathias J. Alten marries Bertha L. Schwind. The couple oversee Schwind and Alten, a paint and wallpaper store at 32 West Bridge Street, Grand Rapids. Alten works for David Wolcott Kendall at the Phoenix Furniture Company. 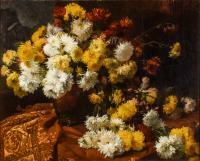 He paints Chrysanthemums, the first of many, signing it “M. Alten,” the signature he would use throughout his career. Birth of the Alten’s first child, Ella (later called Eleanore). Mathias Alten becomes an American citizen and immediately applies for a passport for European travel. A second daughter, Camelia, is born to Mathias and Bertha. Alten sails alone to Europe. Mathias Alten begins his formal artistic education in Paris studying academic painting at the Académie Julian. He later enrolls at the Académie Colarossi and wins a gold medal in figural drawing. Alten explores Italy during the summer, painting and visiting museums in Rome, Florence, Siena, and other cities. 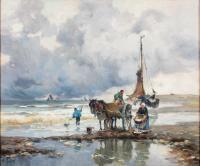 Returning to France, he paints landscapes and peasants along the northern coast at Étaples. Alten returns to Grand Rapids. He and Constant Fliermans open a joint studio and art school in the same rooms where Alten’s first teacher, E. A. Turner had maintained his studio. Alten continues teaching evening art classes in Grand Rapids for the next twenty-five years. 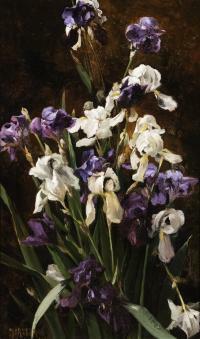 Alten paints Irises and receives a major commission to decorate the walls and ceilings of the Grand Theatre in Grand Rapids. Alten paints the stage scenery for the Landwehr Hall, a Grand Rapids social club for German Americans. Alten makes the first of several visits to the Lyme Art Colony in Old Lyme, Connecticut. 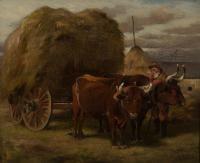 Alten exhibits two paintings at the National Academy of Design, New York and shows Husking Corn at the Society of Western Artists show at the Art Institute of Chicago. A third daughter, Viola, is born to Mathias and Bertha Alten. Alten creates several murals for the F. P. Wilcox home on College Avenue designed by Grand Rapids architect W. R. Clarke. 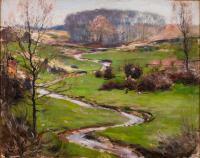 Along with other Grand Rapids artists, five of Alten’s paintings are exhibited at Bissell House in Grand Rapids. Included in the show is Forrest Emerson Mann, who becomes Alten’s longtime friend and travel companion. Alten paints Picnic at Macatawa, a study of the Alten family at leisure. Alten again exhibits at the National Academy of Design in New York and at the Pennsylvania Academy of the Fine Arts in Philadelphia. The Alten family occupies a new home on the northeast corner of Hope Street and Fuller Avenue in Grand Rapids. Alten paints murals in the vestibule and decorates the ceiling of the reception hall with mosaic tile work and other embellishments. Mathias Alten has his first local one-man exhibition at the Ryerson Library in Grand Rapids including sixty-five paintings and drawings. The Art Institute of Chicago exhibits Cutting Cabbage and The Color Mixer. Alten stages an exhibition of thirty paintings in the rotunda of the Morton House Hotel in Grand Rapids. 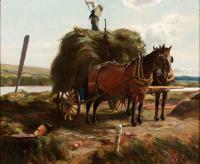 Mathias and Bertha travel to Portland, Oregon, to complete commissioned portraits of former Michigan lumberman John H. Haak, along with his wife, daughter, and son. Alten serves on the committee to select paintings for the soon-to-be established Grand Rapids Art Association (now the Grand Rapids Art Museum). Alten returns to Europe for an extended stay, accompanied by Bertha, their three daughters, and his student Norman S. Chamberlain. The Alten family settles temporarily in Scheveningen, Netherlands, a well-developed resort town in an area replete at the time with fishing villages on the North Sea. 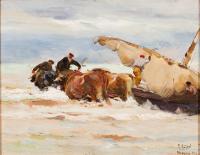 There, the artist produces several paintings inspired by draft horses hauling heavy fishing boats at the seashore, as well as village and canal scenes, seascapes, and landscapes. The family travels through Belgium, France, Switzerland, and Germany. The Alten family returns to Michigan while Mathias Alten returns to Old Lyme, Connecticut. 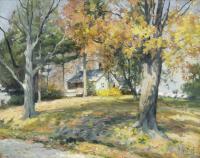 Alten occupies the Old Lyme barn studio of Will Howe Foote, a Grand Rapids native and early member of the artist colony. He paints several autumn landscapes, which he inscribes, “Lyme”. 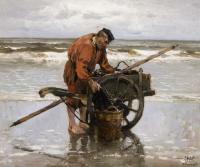 Having become impressed with the work of Valencian artist Joaquín Sorolla, Alten and Forrest E. Mann sail to Spain to experience Sorolla’s paintings in person. 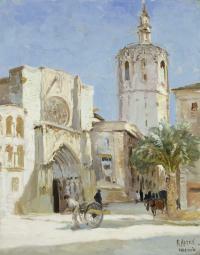 In a letter to Bertha, Alten notes that he has completed twenty-three canvases during his stay in Valencia. After the seven-month sojourn in Spain, including a trip to Tangier, Alten’s color palette shifts from the dark tonality associated with the French Barbizon School to the brighter, modern colors of the Impressionists. Alten instructs life drawing classes for the Grand Rapids Art Students League located above Peck’s Drug Store in downtown Grand Rapids. The large north-light windows were installed entirely for the League’s studio and have only recently been exposed with the removal of the mid-20th century metal sheathing, which covered the entire building. During the 1920s, Altens’ own studio was on the Monroe Center side and was the last of a series of downtown locations where he maintained a publicly accessible studio. Fifty-nine Alten paintings are included in the nineteenth exhibition of the Grand Rapids Art Association. Mathias and Bertha purchase a home at 1593 East Fulton Street. 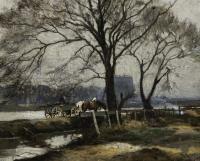 The location of the home was convenient for Mathias for exploration by foot or streetcar to find suitable landscape subjects. The location of their home was also convenient because it was located at the end of a streetcar line that led to his downtown studio. Alten returns to Old Lyme, Connecticut. 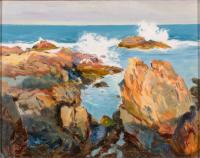 Two Alten paintings are chosen for a juried exhibit at the National Academy of Design in New York. Prominent among the jurors is William Merritt Chase, an established American Impressionist painter. 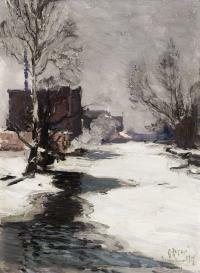 With the outbreak of World War I in Europe, Alten remains predominantly in Michigan painting rural landscapes and scenes of Grand Rapids. Alten receives a commission for a life-size painting, Portrait of Bishop Edward Kelly, Bishop of the Grand Rapids Diocese, and exhibits thirty paintings in November at the Grand Rapids Art Gallery. Alten shows several of his Spanish scenes at the Southby Art Salon in Hollywood, California. 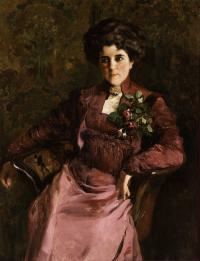 The Milwaukee Art Institute exhibits twenty Alten paintings. Mathias Alten travels to Taos, New Mexico where he paints more than forty canvases depicting Native Americans and the southwest landscape. He becomes acquainted with Irving Couse, a founding member of the Taos Society of Artists, another important regionalist artist colony. Smoking Apache, one of Alten’s Taos paintings, is shown at the National Academy of Design in New York. Alten returns to Spain, this time with his student Kreigh Collins. Acting as her father’s business agent, Eleanore Alten Gilleo, secures commissions for several portraits of Michigan Supreme Court judges. Mathias and Bertha travel to Hollywood, Florida where Alten completes several canvases. The couple then visits the artist colony at Laguna Beach in Southern California, where he produces more coastline compositions in addition to California Mission scenes. Holt Galleries in New York City stages a one-man exhibition. Now in his early sixties, Alten travels within Michigan, New England, and California. 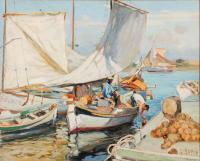 Alten travels to Tarpon Springs, Florida, where he paints Greek sponge fishermen with their colorful boats. His fascination with fishing scenes continues closer to home, where he creates several images of Leland, a picturesque fishing village in Northern Michigan. During his final two years, Alten paints autumn and early winter landscapes in the rural areas surrounding Grand Rapids and continues to exhibit at his home. 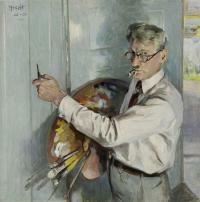 Alten regularly documented himself in self portraits throughout his career. This is perhaps the final self portrait. It was created at Alten’s home studio at 1593 Fulton Street in Grand Rapids. The brushes in his hand are in the GVSU Collection. Mathias Joseph Alten suffers a fatal heart attack in his home.